When you think about competition, your first thoughts probably drift to sports arenas and the like. Yet, competition also lives in the workplace. And, while competition can breed productivity, it’s important to know how to balance the two to create the best workplace environment for your company and your career. The relationship between competition and productivity has been studied by numerous scholars, and most agree that competition can be beneficial in producing a higher level of productivity and efficiency. Healthy competition among your co-workers is a natural way of pushing each other toward team goals. When members of a team are competitive in an appropriate way, there’s more focus, drive, and determination to provide quality work. Along the same lines, competition in the workplace drives efficiency. As this happens, goals are met more quickly, things get done, and the company can see profitable benefits. For competition to create productivity in the workplace, it has to remain healthy. When co-workers become overly competitive, stress levels go up, trust declines, and the overall team can deteriorate. It’s important to find the balance between being competitive enough to drive productivity and being so competitive that you drive away anything beneficial. Learn from mistakes – You will inevitably make a mistake, but when you do, figure out how to learn from it. Sometimes when competing, you may let your competitive drive overshadow the bigger picture, allowing a mistake to happen. If and when you do make an error, take time before you react. Give yourself a breather, relax, and regroup. Focus on relationships – When competition becomes unhealthy, it could be due to poor relationships. You won’t always get along with everyone you work with, but you have to learn to work well with others and grow relationships with those who can help you put your energy into generating productive outcomes. Be a classy competitor – Unlike the sports world, you have to continue to work with and around those you’re competing against on a daily basis. Avoid putting others down and focus on your long-term growth at that company. Let your work be proof of your determination and skill, and if anyone tries to create an unhealthy environment for competition, maintain your integrity. The reputation you build as a classy competitor will speak volumes to your employer. Do you have any tips for balancing competition with productivity? Let us know in the comments section below! 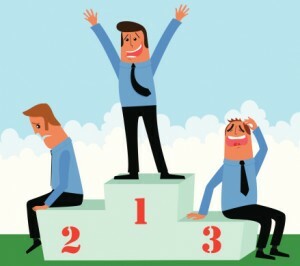 Previous Post Poll: How Do You Beat the Career Competition? If you expect team results you should have “team” rewards. Example: Our team goal is 97% for the month of July, we usually end around 95.5%. If we hit the 97% we all get restaurant gift cards, an extra $150.00 in everyone’s pay check, or celebration with family members who usually help the team as well.